It is happening slowly but it isn’t hard to see where this is going. Apple bought Lala to help it stream music from the Web but they are also putting iTunes App, Music, Movie, etc. Stores on the web as well. 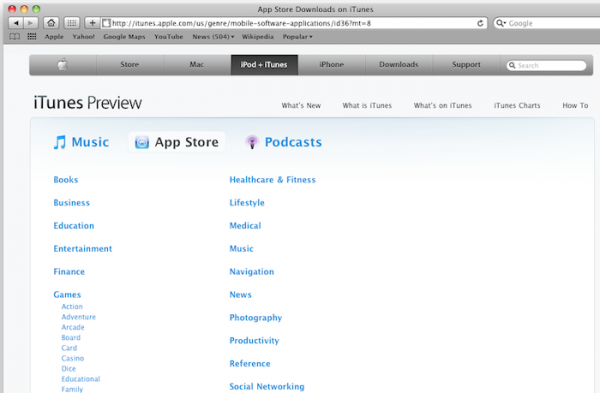 Over the past few months, those links you click to go to the iTunes Store have opened up web pages as well. Today, the iPhone App Store is now a category on the iTunes “Preview” page which allows you to browse through all of the different categories of apps before you buy. Everything but the final purchase of an item can now be done on the Web. You can even preview music on the right in the Webpage before you buy. The next step would be for Apple to make the sale on a web page and then communicate that via the cloud to your iPhone/iPod/iTunes/iPad. The question is: Will Apple go this next step, and if so, when?